Adam and Eve may have found that the leaves of the fig spared their blushes, but it's the fruit that gets me excited. There is little better than the fig tree's produce, so fresh it is still warm from the sun, straight from your garden. Dried figs are equally nutritious: if you have a bumper crop then dry some of the fruit in a hot press or drying cupboard. If you turn them daily they will be preserved in six to eight days. The best variety of fig tree to go for is Ficus carica 'Brown Turkey', whose fruit ripen in late August, and have a reddish-brown skin, red flesh and a sweet flavour. You can also try F. carica 'Brunswick', which ripens a few weeks earlier, and whose greeny-yellow skinned fruit have a sweet tasting pink flesh. F. carica 'White Marseilles' ripens in early September with fruit that have a light-green skin and green flesh. A fig tree will succeed best in a sheltered position in full sun. A south or south-west facing wall is ideal for growing and training a fan-shaped fig - use horizontal wires fixed to the wall 45cm (18in) apart. Grow the tree in a 45cm (18in) diameter pot of soil-based compost. Keep the top of the soil 7cm-10cm (3in-4in) below the rim of the pot to allow an annual spring top-up with compost, as well as to facilitate watering and feeding. Either plunge the pot into the soil against the wall or keep it above ground. That way, you have the advantage of being able to move it to a sheltered spot during severe weather. Alternatively, plant into the soil at the base of the wall where the root run is restricted to a planting pit that is 60cm by 60cm (2ft by 2ft) and 60cm (2ft) deep. Dig the hole directly in front of the wall, bearing in mind that it involves a lot of digging and several barrow-loads of soil. Line the three open sides of the hole with 60cm (2ft) square concrete paving slabs stood upright, so, with the wall, they form a 60cm (2ft) square box. Add 15cm (6in) of broken bricks or clean stone to the base of the hole for drainage. Fill the pot or planting hole with soil-based compost or sterilised topsoil with a layer of well-rotted farmyard manure or compost in the base, and plant the fig at the same depth as previously grown. With the roots of the fig confined to a small area it will be essential to water the tree, especially during summer when the fruit is swelling and remember to net the tree early, to prevent birds stealing the crop. 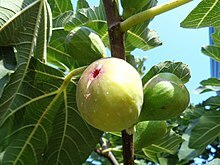 The figs are ready to pick when the fruit droops on its stalk and the skin is well coloured. If the skin cracks open it is fully ripe and you may notice a drop of nectar. Prune the tree in late spring, removing shoots and buds that are pointing inwards, as well as those pointing directly out from the wall, and any growths damaged by late frost. Remove debris and prunings, and apply a 10cm (4in) deep layer of farmyard manure over the root area. When the fruit starts to swell apply a high-potash liquid feed such astomato fertiliser weekly. Figs are easily propagated by layering. Bend a suitably low branch to the ground and where it meets the soil, wound the stem by cutting part way through. Loosen the soil and add compost. Peg the branch down using U-shaped pins and bend wires either side of the wounded area. Cover with more soil, water the ground and place a flat stone on top. Fresh figs are in season from August through to early October. Fresh figs used in cooking should be plump and soft, and without bruising or splits. If they smell sour, the figs have become over-ripe. Slightly under-ripe figs can be kept at room temperature for 1–2 days to ripen before serving. Figs are most flavorful at room temperature. Raw figs are a good source (14% of the Daily Value, DV) of dietary fiber per 100 gram serving (74 calories), but otherwise do not supply essential nutrientsin significant content (table). In a 100 gram serving providing 229 calories, dried figs are a rich source (> 20% DV) of dietary fiber and the essential mineral, manganese (26% DV), while several other dietary minerals are in moderate-to-low content.